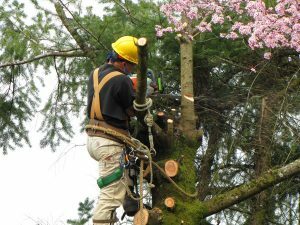 How to Hire Professionals for Tree Limbing or Tree Removal Ottawa - Crowe Tree Service Inc. Trees can be a great addition to any yard as they offer shade from the hot summer sun as well as an aesthetically pleasing part of nature in your yard. Perhaps this is a place where your kids or grandkids swing and play throughout the day. These are all great aspects of having trees in your yard however there are times when these tall Goliaths can pose a serious danger if they are at risk of falling down on your house, car or even a person! There are certain times where tree removal or at least tree limbing is necessary to ensure safety for all those around and property nearby. You may be wondering if this is a job you can tackle on your own. When thinking about this picture a loose branch flying through a window and shattering glass or the potential dangers of falling from the tree. These examples may seem dramatic but they are very much real scenarios that can happen during the tree removal process. Deciding to hire a professional tree removal specialist in Ottawa is a good move. Tree removal in Ottawa is not something that just anyone can do so you should be wary of John the Handyman promising that he can remove your tree for you at a cheaper price because there are techniques and equipment needed to do the tree removal properly and most importantly the tree removal company in Ottawa should have good insurance to cover anything that gets damaged since accidents do happen. Our tree removal team has decades of experience working with trees and tree removal and tree limbing to get the job done right. We’ve seen and heard a lot of horror stories to know that this is not a task for just anybody to tackle. For example, if the appearance and health of the tree is important to you then insist on the tree removal team using ropes or ascend with an aerial lift rather than using the harsh tree climbing spikes. If the tree is to be completely removed then this is not an issue of course but if it is just a tree limbing that is to be performed than this is the way to go. It is also a good idea to make sure that the tree removal service in Ottawa has good references. We have many so just ask and we’ll gladly share with you. We handle each tree removal job with care and consideration to ensure that the tree is removed without damage to your property or anyone present. When it comes to tree removal and tree limbing it is best to hire a professional tree removal and tree limbing company to ensure the job is done right!